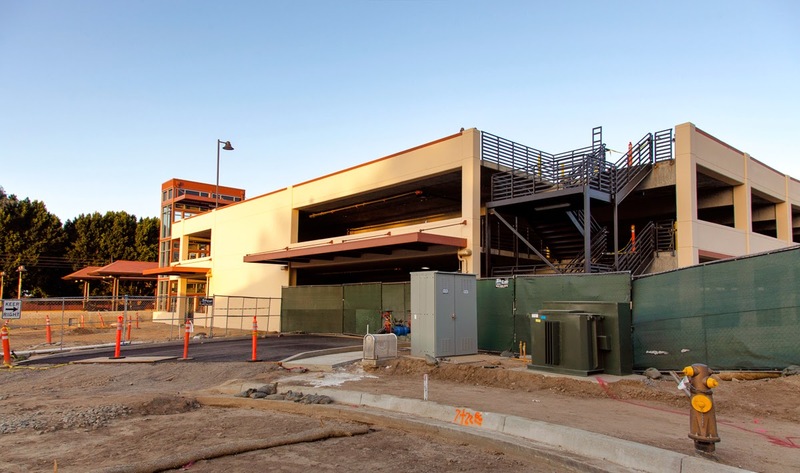 The new Gold Line parking structure with the station canopies visible behind. For years people drove up and down Myrtle Avenue and it never even registered with so many that the old Monrovia Depot was even there. Soon it will likely be the busiest spot in town. Quite a change. I hope the old depot gets treated well as part of it. I thought the old depot was a part of it - the official station - No? It must be. The artist they selected specializes in Bachhalder tiles. She owns all the old molds that were dug up in someones back yard. Funny I drive down Myrtle all the time, watch the trains practicing - but haven't seen this parking structure. I'm just happy that the google style car wash is staying along with the depot. Pas Adj: The old depot remains a separate building. The new load station is a little further to the west. The parking structure is closer to the next block to the west (Magnolia Ave.) You can see the parking structure from Myrtle if you look quick. There will be a large apt. complex around the parking structure soon. I hope the depot stays. As of now, no firm plans and the silence re: this depot is deafening.